Good business decisions give way to success, employee satisfaction and repeat customers. 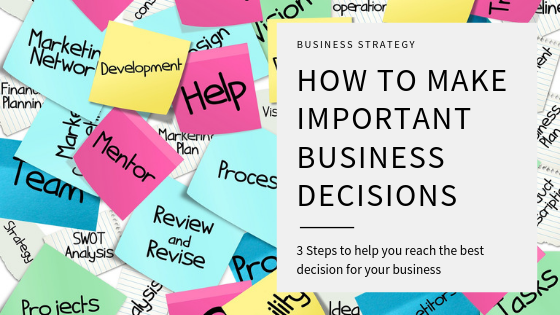 When making significant decisions to help your business grow, there are some important steps you should take before reaching your final verdict. Information is power and here are some steps to ensure you are ready to make those decisions that will propel your company to great success. If your goal is to build on your customer database, or you wish to improve your clients experience with your company, it goes without saying that knowing your business is vital. This may be a time consuming and ongoing task but essential. Without knowing your market, you can not build on it. Do the research necessary to find out what makes your industry tick. Find out what is trending and what has gone the way of the Do Do Bird. Learn what your competitors are doing and what your potential clients are looking for from your type of product or service. Once armed with the data from your market research and competition stalking, take the time to review it. Focus not only on the long term but on short term goals. When the information you gathered is analyzed you are better able to make informed decisions. Pay attention to any red flags that pop up and deal with them swiftly. This is also a good time to go over your financial statements, find out where your fiscal strengths and weaknesses are. Your marketing team also plays an important role in the analysis phase. The marketing team should use the information about customer’s buying processes to know how to better use social media, marketing materials, and distribution channels to effectively impact customer acquisition. When in doubt, ask your business peers for any nuggets of insight. You are only human and are bound to miss some important facts and figures from time to time. You can also ask clients about their customer experience and learn what draws them in or leaves them feeling empty. Hire a consultant to help go over your business plan, financials, management process, or current marketing strategy. There is no shame in asking for advice. It is important to make informed decisions, so don’t rush it. With time, you may find better alternatives or that your industry has changed. Rome wasn’t built in a day. With the right information and understanding of the facts, you are better prepared to make decisions that will help your business grow and avoid past mistakes. Stay the course, continually re-evaluate your business as it grows.